DENVER–The Bakken/Three Forks play in western North Dakota and eastern Montana is producing 750,000 barrels of oil a day, which is roughly one-quarter of Iraqi production or pre-sanctions Iranian production, and it exceeds the entire output of OPEC-member Ecuador. It is for real. The Bakken/Three Forks also represents the leading edge of the boom in North American tight-rock, unconventional oil production that now is sweeping the Eagle Ford in South Texas, the proud Permian Basin, the Utica in Ohio, Niobrara in Colorado, and many more to come. The unconventional revolution that began only 12 years ago with a surge in natural gas production from the Barnett Shale in Texas has shifted to a focus on producing oil and natural gas liquids. After delivering abundant natural gas supplies to the United States at less than one-third the cost of any other industrialized nation and stirring an industrial revival, it is reversing a 35-year decline in U.S. oil production. Growth in domestic oil production over the past year represents more than half of the growth in total world oil production. The diversity of completion designs for horizontal drilling and high-intensity, stage fracturing across the Williston Basin, however, shows that companies are drawing quite different conclusions about their experiences, which is yielding vast differences in production response. Some production differences can be explained by reservoir quality changes. For example, the last wave was in the higher-permeability and more intensely naturally fractured Parshall and Sanish fields, while development now is focused on the tighter rock in the Bakken Central Basin. However, much of the production difference is the result of dramatic differences in completion strategies and fracture design. A novel completion approach was developed for the Bakken Central Basin that employs “plug-and-perf” (P&P) technology in an uncemented liner with high-rate, large-volume, slick-water fracture treatments and the exclusive use of high-quality ceramic proppants. While these jobs can present significant execution challenges, the superior production results warrant this approach to Bakken Central Basin development and possibly other Bakken areas. As with cracks on a windshield, hydraulic fractures in reservoir rock do not initiate easily, and growth tends to occur where fractures or points of weakness exist. Economic production in tight reservoirs is heavily dependent on the extent of reservoir rock contacted and effectively connected to the well bore. P&P completions begin by creating multiple prefractured-rock initiation points from multiple perforation clusters in each 250-300 foot-long stage interval. Simultaneous growth of multiple hydraulic fractures results from injecting low-viscosity fluid at sufficient rate to ensure flow is diverted across the four to five perforation clusters employed in each stage. The low-viscosity fluid also encourages fractures to initiate in other planes of weakness, further enhancing hydraulic fracture complexity and maximizing contact area within the reservoir. But simply touching a large amount of reservoir rock is not enough. One must also create sufficient conductivity to allow multiphase fluid flow through the fractures and the dramatic choke that results from convergent flow into a well bore that transversely or obliquely intersects the fracture networks. Hydraulic fracture height growth above the Bakken formation can be significant, and the poor proppant transport characteristics of slick water keep most of the proppant near the bottom of the created fractures–likely mostly within the productive 30-80 foot-thick Middle Bakken interval, which is bounded by the Upper and Lower Bakken shales. When maximizing the contact area and fracture complexity to touch the most rock, creating partial proppant monolayers probably is more the rule than the exception above the settled proppant pack at the fracture base. Using small-mesh proppants helps transport them deeper into the fracture system, and stronger ceramic proppants provide the necessary strength to maintain conductivity. Higher effective stress is carried by individual proppant grains in a partial monolayer, compared with the grain stresses in a conventional proppant pack. Increasing fracture contact area by several times inevitably reduces the pounds of proppant per square foot of fracture area. How can stimulation engineers design completion and fracture treatments to create hydraulic fractures with the two Cs (contact and conductivity)? We believe there are three critical components that individually contribute to an improved production response in Central Basin Bakken wells. First, a P&P completion strategy helps create multiple distinct and distributed initiation points within each fracture stage. Creating several hydraulic fractures 50-60 feet apart in each stage allows more effective drainage of the tight Bakken reservoir. In contrast, fracturing through sliding sleeves can be expected only to initiate a single hydraulic fracture per stage, at either a swell packer or another randomly located natural fracture or point of weakness along the lateral length. The ability to create complexity and reservoir contact area through a fracture system depends on the well completion and the fracture treatment design. In Figure 1, the left picture represents the simple fracture system that likely is created by pumping viscous gel through a sliding sleeve at a moderate injection rate. Once a fracture is created–possibly near one of the external packers because of the tensional forces in that area–it is very hard to divert fluid flow effectively to initiate other fractures. Even with high injection rates, it is difficult to induce a second fracture along an unperforated well bore, since the initial fracture can simply open fractionally wider to accommodate the flow as fracture pressure increases with only the quarter power of injection rate. On the other hand, a perforated liner, shown on the right side of Figure 1, with several isolated perforation clusters and the total number of perforations engineered to force flow through nearly all of them, will lead to initiating hydraulic fractures at each cluster–typically four or five per stage. Although there is communication along the backside through the annulus of the uncemented liner, the flow-rate squared dependence of pressure drop through perforations will force nearly all perforations to break down and initiate hydraulic fractures at each cluster. The second critical completion component for Central Basin Bakken wells is slick water, which will help create widespread fracture complexity. A viscous gel encourages a simpler or more dominant frac system that is more appropriate for higher permeability formations. Microseismic mapping of Barnett Shale slick-water refracs that were treated initially with cross-link gel reveals both a higher density of microseismic events and wider dispersion of events, indicating greater fracture system complexity. The production response was improved significantly in the tight Barnett Shale because of increased surface area from high-rate slick-water fracturing versus conventional gel fracturing. The low-viscosity fluid is expected to more easily penetrate natural fractures or other planes of weakness, even if these planes are at slightly different orientations than the preferred fracture plane. In the Barnett Shale, propagation in two distinct orientations was evident from both microseismic and surface tilt fracture mapping, and was believed to be made possible by the lower horizontal deviatory stress and the presence of natural fractures at a roughly orthogonal orientation with respect to the preferred fracture plane. In the Bakken, the case for complex fracture growth in distinct orientations is less obvious, but a low-viscosity fluid certainly will help to enhance the possibility. Slick-water treatments are not always easy, and have proven challenging in Middle Bakken horizontal wells. Slick-water treatments exhibit higher premature screen-out risk in long laterals; are tougher on pumps, fluid ends, power ends, etc. ; and present challenges in economically securing the increased volumes of treatment water required. In addition to the screen-out risks associated with pumping proppants through a 10,000-foot lateral, Bakken treatments are even more prone to screen-out risks because of the oblique orientation between well bore and the preferred fracture plane. The connection between the well bore and the far-field fracture becomes more complex when the well is oriented at an oblique orientation with the principle stress components. In the Williston Basin, the oblique angle originates from the northeast-southwest preferred fracture orientation and the now-dominant north-south well bore trajectories. Prior to 2010, operators could elect to permit either a single-section 640-acre well or a dual section 1,280-acre well, but in March 2010, the North Dakota Industrial Commission placed the remaining extent of the Bakken reservoir on 1,280-acre spacing. This effectively requires operators to drill 9,500-foot laterals in order to hold a drilling spacing unit (DSU). This has resulted in wells being drilled primarily in a north-south orientation, while the preferred fracture plane in the Williston Basin is at an oblique angle with an orientation at about north 50 degrees east. As shown in Figure 2, enhanced screen-out risk is associated with oblique fractures. While poor proppant transport with slick water in long laterals is a challenge, poor proppant transport in the fracture helps to keep most proppant within the Bakken interval. Microseismic mapping of Middle Bakken treatments has consistently shown dramatic upward fracture height growth (Figure 3). Slick water’s poor proppant transport helps assure that most of the proppant is not transported upward, out of the Bakken, and instead remains within the Middle Bakken pay interval. Poor proppant transport in slick-water treatment is beneficial for in-zone proppant placement. Upward out-of-zone fracture height growth is virtually impossible to control in the Bakken, even at low injection rates, while downward growth generally is limited because of higher stresses in the Three Forks formation. As the hydraulic fracture system generally grows upward by hundreds of feet into the Lodgepole formation, poor proppant transport minimizes proppant placement across this zone with potentially high water cut and the presence of hydrogen sulfide, placing most of the proppant in the zone where it can aid Bakken oil production. The third critical component for an improved production response in Central Basin Bakken wells is a high quality ceramic proppant, which creates a long-term conductive connection between the reservoir and the well bore. Maximizing reservoir contact area would all be for naught if one couldn’t also sustain oil flow from much of the contacted rock. Smaller proppant sizes (40/70 mesh) are used to prop deep into the created complex fracture network, while moderate-size proppant (30/50 mesh) provides conductivity in the main fracture system. The low proppant concentrations (generally up to one pound per gallon) in Bakken slick-water treatments most likely result in a combination of settled pack and partial proppant monolayers, and proppant bridging at pinch points (Figure 4). The higher point loading is handled better by stronger ceramic proppant, and the created distribution provides enough strength to keep the system conductive. Moderate-rate gel treatments through sliding sleeves most likely create only one or two initiation points along the lateral interval between swell packers, whereas high-rate slick-water treatments with fracture initiation through perforations greatly enhance fracture complexity. As a result of the much greater reservoir contact area, there is greater need for high-strength proppant in the slick-water application, since proppant is distributed over many smaller fractures, most likely creating partial proppant monolayers. Bakken frac fleets typically are composed of six-eight pumping units, since they are required to pump at rates only of 20-50 barrels a minute (bpm). An eight-pump frac fleet injecting at 40 bpm and 7,500 psi has about 50 percent excess/standby pumping capacity. In order to inject slick-water fracs at up to 80 bpm and 9,500 psi, it is necessary to have a minimum of 10 pumping units (12 with standby units) in the frac fleet. While such a frac fleet is standard (and often significantly larger) in most of the gas shale areas that utilize slick-water fracturing, this has not been standard in the North Dakota pumping service industry. For this reason, and also in part because of the lack of pumping service capacity in the basin during late 2010 and 2011, Liberty Resources developed its own capability to pump high-rate slick-water fracs by launching Liberty Oilfield Services. The Bakken is an overpressured reservoir with pore pressure gradients in excess of 0.75 psi a foot in the deepest parts of the basin. As a consequence, post-frac flow-back fluid volumes provide an almost immediate indication of stimulation effectiveness. It is not unusual to start cutting oil within the first 24 hours of flow back as formation fluids are produced in addition to the fracturing fluid. Maximum production rates typically are generated during the plug or seat drill-out phase, since reservoir pressure is still charged by the injection of stimulation fluids. However, variation in drill-out procedures between operators means the initial flow data are not a suitable metric for direct comparison of different completion designs. 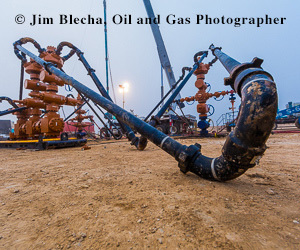 Similarly, differences in flow-back procedures and choke settings in the early operating philosophies of different operators also yielded significant variations in 30-day cumulative production data. A 2010 study by TudorPickeringHolt, which was conducted across all Bakken development regions of the Williston Basin, gave correlations of R2 = 0.96 between 90-day cumulative production and forecast estimated ultimate recoveries predicted from historical well production. Therefore, 90-day production results are believed to be a good metric for long-term production performance, and are used to compare the efficiency of completion procedures. To evaluate production performance for the slick-water-only design, we compared production results in a relatively small area of the Bakken Central Basin, where a variety of completion designs where implemented in a statistically relevant number of wells. We chose the area within and surrounding Township 156N-R101W in Williams County, N.D., since this is one of the main areas where Liberty Resources holds acreage. Sliding sleeves were used in cross-linked gel fracture treatments to place either sand or ceramic proppant. About 25 stages were conducted per well, with each stage placing 2,800 barrels of clean fluid and 105,000 pounds of 40/70 and 20/40 sand or ceramic proppant. P&P was employed with hybrid slick water and cross-linked gel to place sand and (mostly) ceramic proppant. Between 26 and 32 stages aimed to place about 3,000 barrels of clean fluid and 122,000 pounds of 40/70 sand, 20/40 sand and (mostly) 20/40 ceramic proppant per stage. P&P was used with high-rate slick water to place ceramic proppant. Thirty-five stages generally placed 7,000 barrels of clean fluid and 115,000 pounds of 30/50 and 40/70 ceramic proppant per stage. This 90-day production bubble map compares gel, hybrid and slick-water treatments within or surrounding Township 156N–R101W in Williams County, N.D. The gel, hybrid and slick-water treatments employed near T156N-R101W resulted in dramatic differences in 90-day production volumes. Figure 5 is a 90-day production bubble map with three colors, illustrating the dramatic differences in performance of these approaches in the same neighborhood. Figure 6 shows the 90-day production results sorted by completion strategy within this section of the Bakken, which was localized so that reservoir variability was minimized. As can be seen, the three completion and stimulation designs have large variations in 90-day cumulative production. Averages range from 19,100 barrels of oil for gel with sleeves, 28,800 bbl oil for hybrid plug and perf, and 49,300 bbl oil for the slick water only strategy. Clearly, with wellhead commodity prices of more than $80 a barrel, the increased time and costs of the P&P completion design with slick-water fracturing is highly economic. We also investigated whether the benefits of the slick water-only design extended across the rest of the Central Basin. The answer clearly is yes. As of September 2012, there were 870 Central Basin wells in the NDIC’s public database that had at least one month of production data. Of those, 58 were completed with our slick water-only approach. Absolute 30-, 60- and 90-day production responses for all wells in the Central Basin are sorted by operator. Well counts are shown next to the operator label. Per-operator production responses for wells in the Central Basin are normalized by reservoir thickness and acreage per well. Well counts are shown next to the operator label. Figure 7A is a bar chart of 30-, 60-, and 90-day cumulative oil production for all companies operating at least five wells in the database. As can be seen, there is a wide range of performance. Perhaps more instructive is Figure 7B, which presents the same data normalized to account for lateral length (640-acre or 1,280-acre DSU) and for variations in the gross thickness of the Middle Bakken interval. This shows that the P&P completion design with slick water and ceramic proppant fracs has greater than 25 percent better normalized cumulative production over 90-days, compared with any other completion and stimulation design employed. Clearly, Bakken completions focused on contact area and conductivity make better wells. Slick water may be trickier, but production results appear to justify the learning curve. Further evaluation of the design specifics are planned, with expected evaluations of ceramic proppant types–economy light weight versus intermediate strength, and smaller versus larger proppant–fluid volumes per stage as dictated by reservoir quality and formation thickness; and distinct stages per perf gun runs versus multiple “hesitation” stages for fewer perf gun runs. Bakken development is early stage and still mostly in “held by production” mode. Well quality and efficiency (EUR per dollar) is improving throughout the Bakken. Slick-water treatments with ceramics and more stages are more costly than the typical Bakken completion. However, the increase in production response generally helps to pay back these additional costs within the first few months, with additional improved production as icing on the cake. We believe there is merit in a well completion approach focused on EUR per dollar versus simply minimizing completion or total well costs without considering the impact on EUR. Unconventional reservoirs display significant variability across the various plays being developed and within the plays themselves. Completion and fracturing strategies should reflect these differences. Our P&P, high-rate slick water with ceramics is not the magic bullet for everywhere, but it is delivering the best results in the Bakken Central Basin. In the 1990s, companies drilled $1.0 million wells and placed $150,000 frac jobs. Today, we drill $4.0 million wells and invest $4.0 million intensively fracturing them. A much greater percentage of development dollars is dedicated to what ultimately drives reserve recovery in unconventional reservoirs. That is progress. Editor’s Note: The authors acknowledge Liberty Resources, Zavanna, and Liberty Oilfield Services for their permission to release these data for publication. They also would like to thank Stacy Strickland, Jeromy McChesney and Kate McKay for their help in preparing and reviewing this article. Chris Wright is chief executive officer of Liberty Oilfield Services and CEO of Liberty Resources. He completed an undergraduate degree in mechanical engineering at the Massachusetts Institute of Technology and then performed graduate work in electrical engineering at both UC Berkeley and MIT. Wright founded Pinnacle Technologies, and served as CEO and chairman for 14 years. Pinnacle’s most significant achievement was its lead role innovating fracturing practices that led to commercializing shale gas production. Wright was chairman of Stroud Energy prior to its sale to Range Resources in 2006. He is a director of TAS (industrial energy technology company), Kerogen Exploration, PyraMax Ceramics, Liberty Oilfield Service, and Liberty Resources. Mark Pearson is president of Liberty Resources LLC. An accomplished executive with more than 30 years of experience in the upstream business, he is an expert in well completion and stimulation. In 2005, Pearson was named a distinguished member of the International Society of Petroleum Engineers, and is an SPE distinguished lecturer for 2012-13 on the topic of hydraulically fracturing horizontal wells. He graduated with B.S. (first class honors) and a Ph.D. from the Camborne School of Mines, U.K., and is a graduate of the Harvard Business School Advanced Management Program. Larry Griffin joined Liberty Resources in 2011 and is responsible for operations. He has more than 30 years in the oil and gas industry, starting with ARCO in West Texas and Alaska. He joined Pinnacle Technologies in 1998, and as vice president of reservoir diagnostics, was instrumental in developing fracture and reservoir diagnostics (microseismic, tilt, and fiber-optics), including the pioneering applications of microseismic in the Barnett Shale. Following that, he joined Newfield Exploration as completions manager for the Arkoma and Anadarko basins. Griffin has a B.S. in petroleum engineering from Texas Tech University. Leen Weijers is business manager for Liberty Oilfield Services LLC. He completed his doctoral research at the Faculty of Mining and Petroleum Engineering at Delft University of Technology in the Netherlands by conducting fracture growth model experiments to investigate the interaction of hydraulic fracture systems with horizontal and deviated wells. Weijers worked at Pinnacle Technologies between 1995 and 2011, where he initially focused on helping clients design and execute hydraulic fracture treatments. Between 1999 and 2006, Weijers was in charge of developing the industry’s most widely used fracture growth simulator, FracproPT. Brian Weaver joined Liberty Oilfield Services as sales manager early in 2012. He started in the oil and gas industry as a well stimulation field engineer with Schlumberger in Grand Junction, Co., and has worked in the Piceance, Uinta, Green River and Paradox basins. After Schlumberger, Weaver joined Pinnacle Technologies as a project manager for fracture diagnostics. With Pinnacle, he managed microseismic and microdeformation (surface tilt meter) mapping projects in nearly every basin in the Rockies as well as projects in Texas, Pennsylvania and Alberta. Weaver earned his mechanical engineering degree from Colorado State University.